I could see a carpet of twinkling lights from the ack ack all along the rail sidings which bordered the canal. I dove onto these with my cannons going. Then suddenly, when the attention of all the guns turned on me, I realized how foolhardy I was being. I ran the guns along the row of rail trucks--opened the throttle wide and pulled straight up for the clouds--with tracers crossing in front and on all sides of the plane. 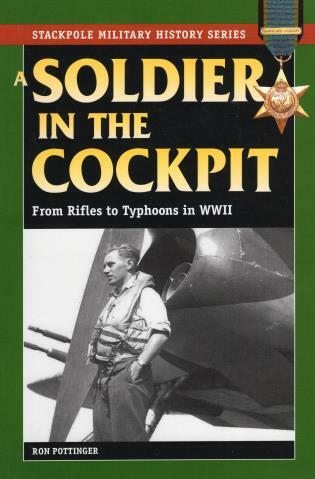 Ron Pottinger started the war as a rifleman in the Royal Fusiliers, then transferred to the Royal Air Force, where he began flying the 7.5-ton Hawker Typhoon. He flew dozens of dangerous ground attack missions over occupied Europe through bad weather, heavy flak, and enemy fighters before being shot down and taken prisoner. Ron W. Pottinger lives in England.